Most medieval copies of 'On the nature of things' include diagrams of some kind. 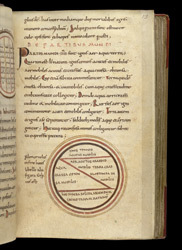 'The four parts of the world are fire, air, water, and earth,' says the first sentence in this section, explaining the physical makeup of nature according to the most widespread theory of medieval times. The diagram shows their arrangement of the four component parts according to their qualities. A note to the left of the diagram alerts the reader to more diagrams at the end of the book.